I really like where we live. 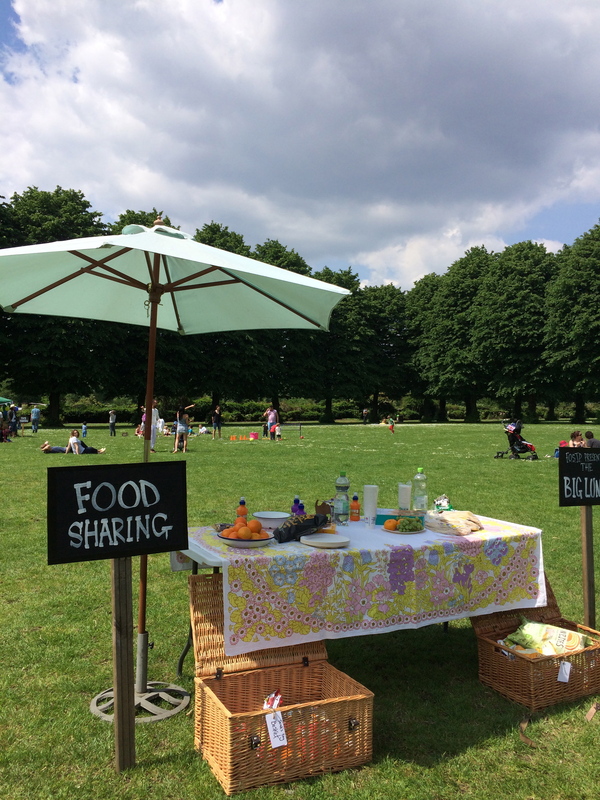 I know most people would hope to say the same, but there’s a lovely sense of community around here – something that London is sometimes criticised for lacking. 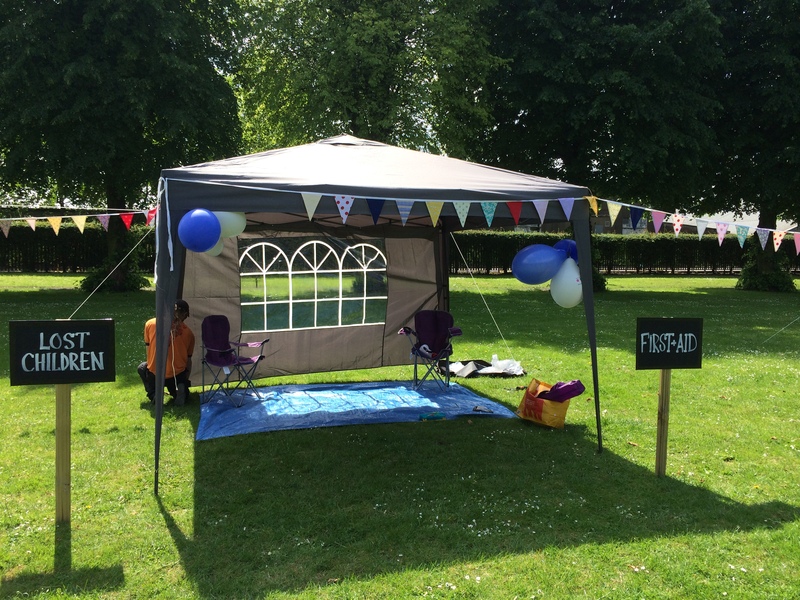 We have a brilliant park at the end of our road and last June we formed a ‘Friends of…’ group to try to make the most of it, and make it into a thriving local resource. 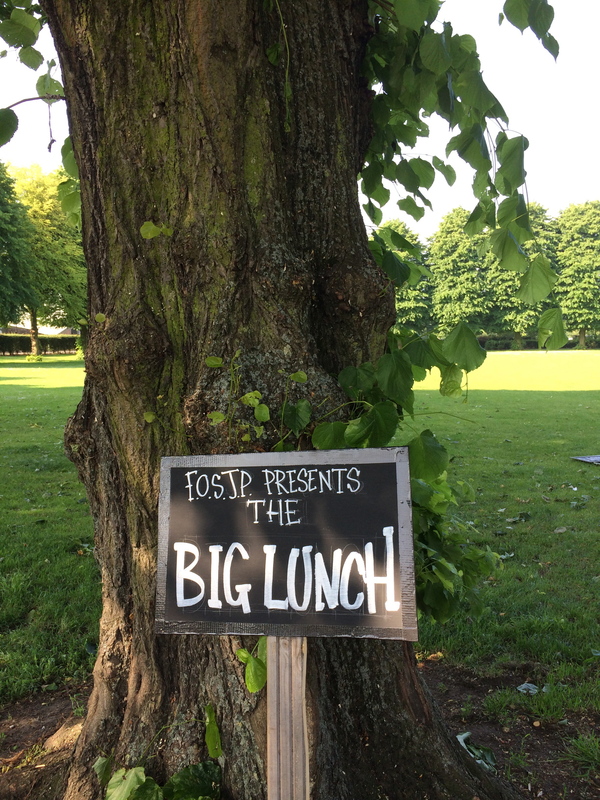 We did some bulb planting last year but our first major event was hosting The Big Lunch on 1st June. We knew the weather would make or break it. I woke up at 5:30 on Sunday morning and my first thought (after ‘oh Sproggett go back to your own bed) was ‘zomg it’s bloody well sunny’ and it turned out to be a scorcher. We were on site from 9:00 setting up, and left at 5:00 after a brilliant day. 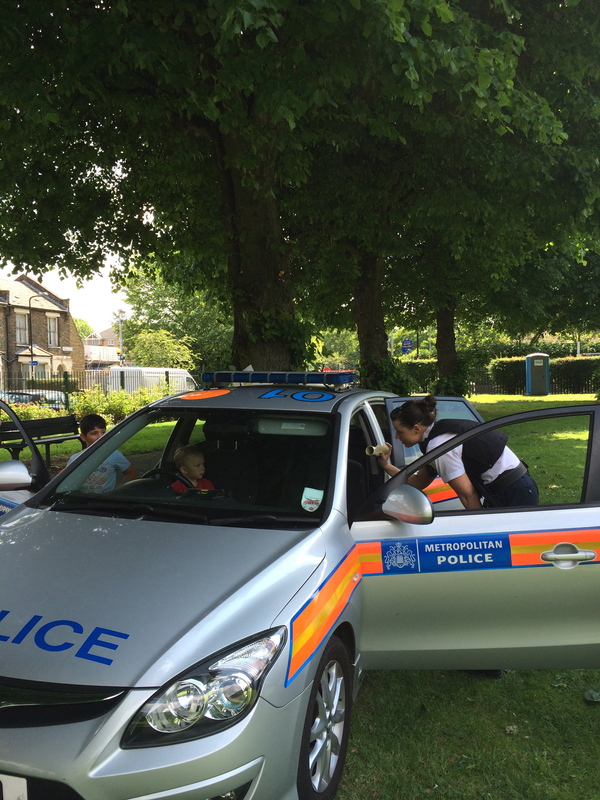 We had yoga for kids, bee hotel making with Friends of the Earth, a police car to clamber into, ‘art growing on trees’. 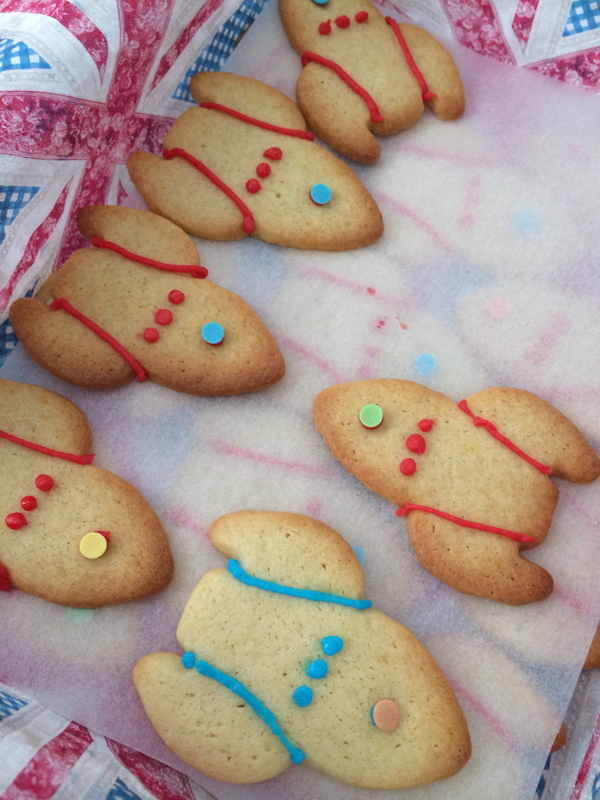 I was mostly behind the cake stall (having baked all Saturday, after our last three-hour planning meeting – including biscuits that were supposed to be rockets but actually looked like cycloptic monsters wearing braces, see below) and lovely lovely Edd came to judge it. 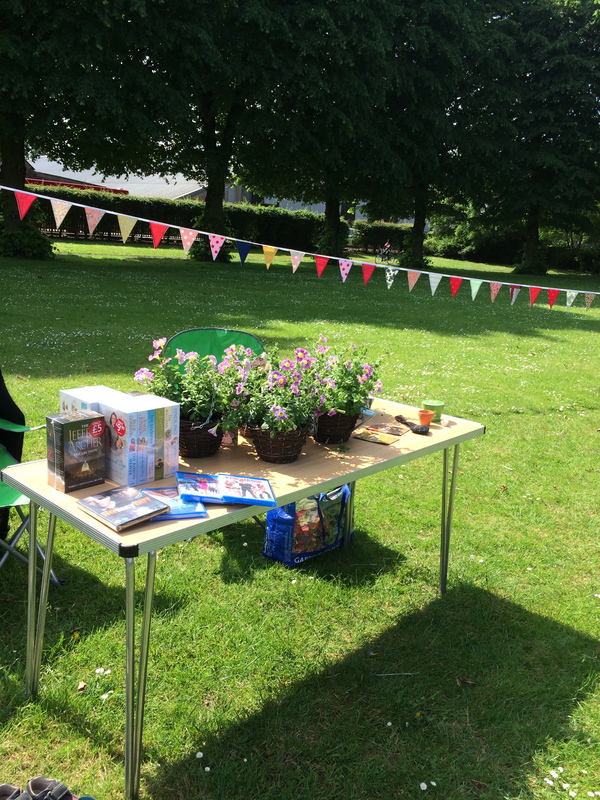 Even the Bunting for Life got an outing. 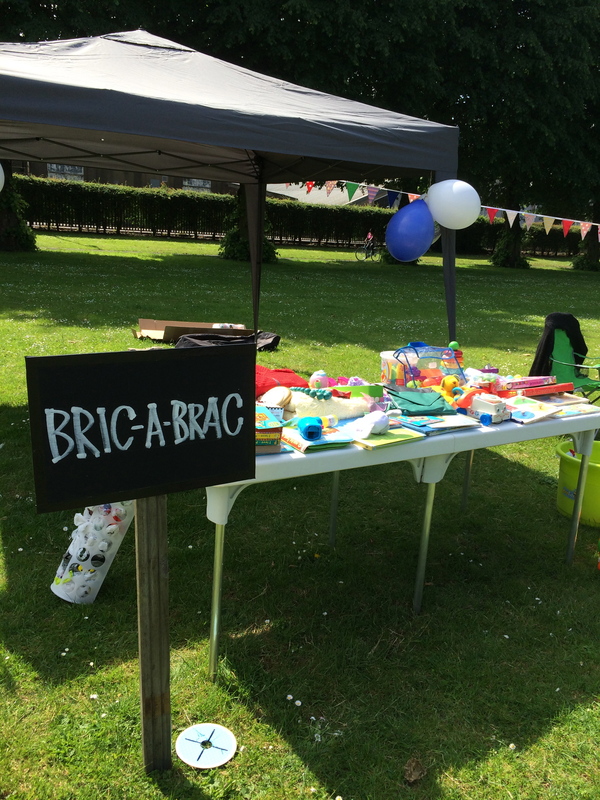 We enlisted some of the visitors to the Big Lunch for a few minutes to help for the tear-down We got chatting with people who tentatively ventured ideas for future events we could do, and it was so great to see people get excited, and see the potential in our park and our community. We’ve already been asked what we’re going to do next (which is a bit like asking someone with a newborn when she’s having the next one, #toosoon) but we have tentative plans for something Bonfire Night related. Lots of small children and fire, what on earth could go wrong? 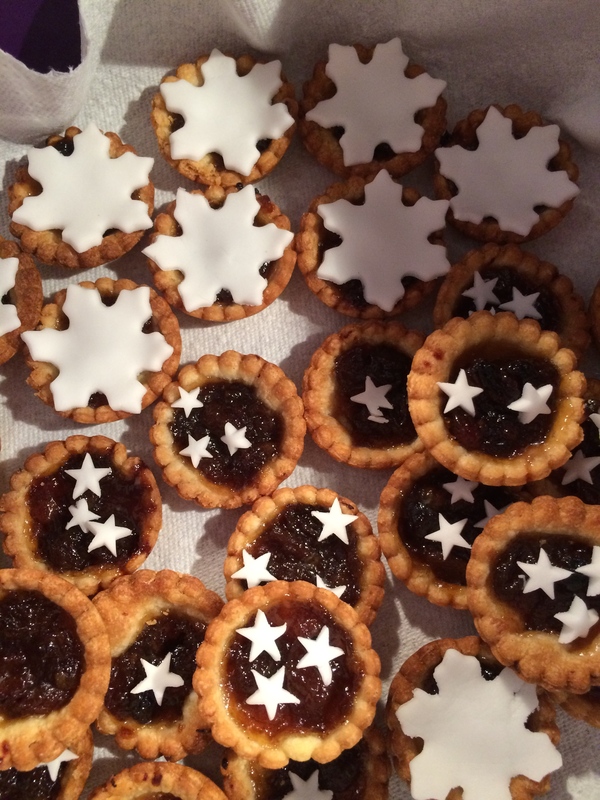 There are lots of rewards for different levels of funding, or you could just sign up in advance for some of their classes – sounds like pretty good value at £30 a session. 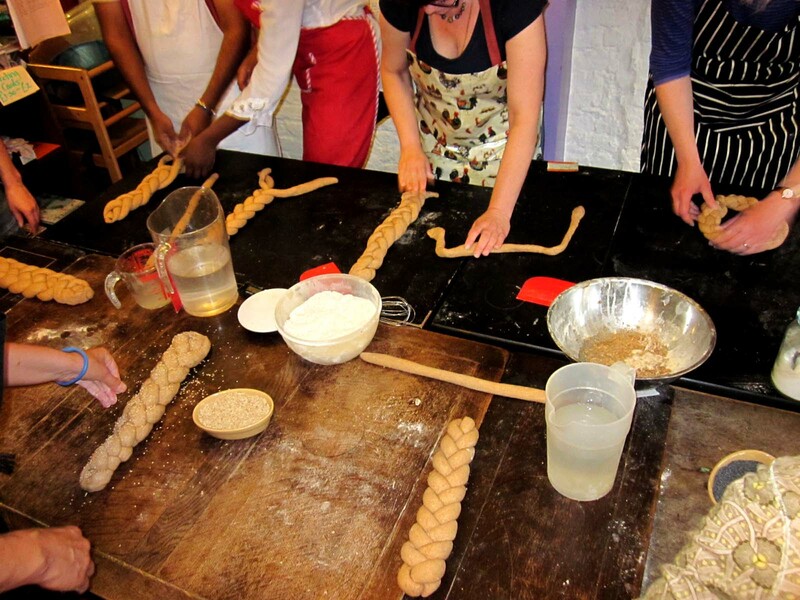 The £3000 will pay for the oven and its installation, to allow then to get off the ground teaching more classes and baking more bread to sell. Have you been to any of their classes? Would love to hear a first-hand account! I’ll be honest. 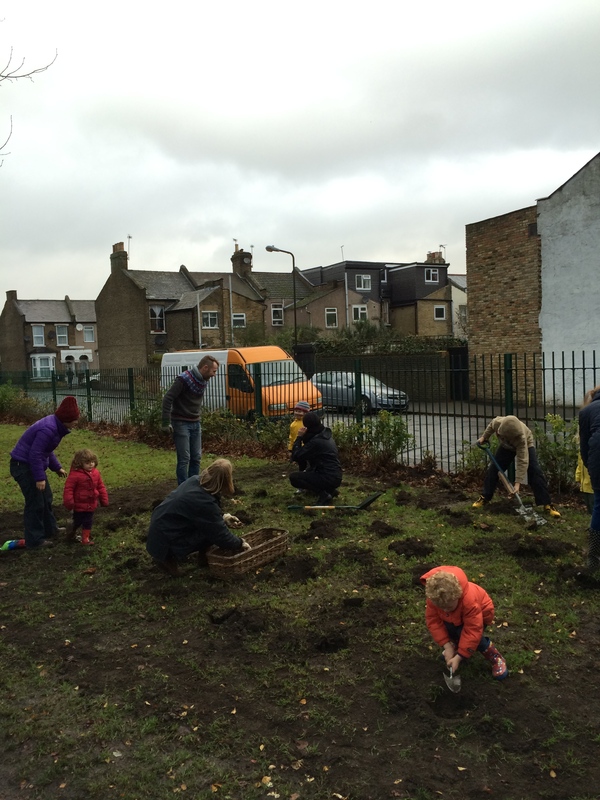 It wasn’t the most auspicious weather in east London last Sunday, for our community group’s first event, planting 400 daffodil bulbs. It started off fairly dark and dank. The gazebo we’d brought almost lifted off in the winds and everything was pretty soggy, including us. Someone clever had brought a big tin of Celebrations though, and I’d made enough Splody Pies for the entire neighbourhood. We thought that the rain might mean that the ground would have softened a little. We were entirely mistaken. Gah. 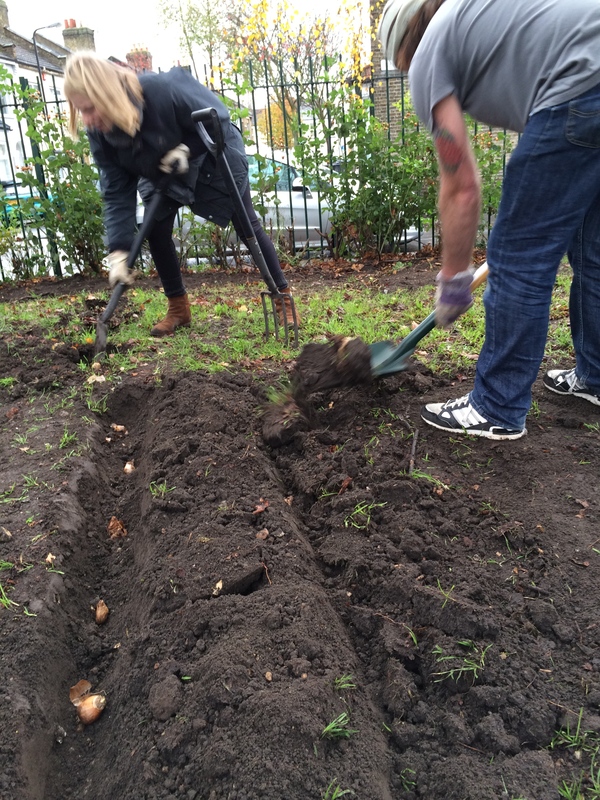 But everyone got stuck in – literally – and we got through all of the bulbs in 2 hours. 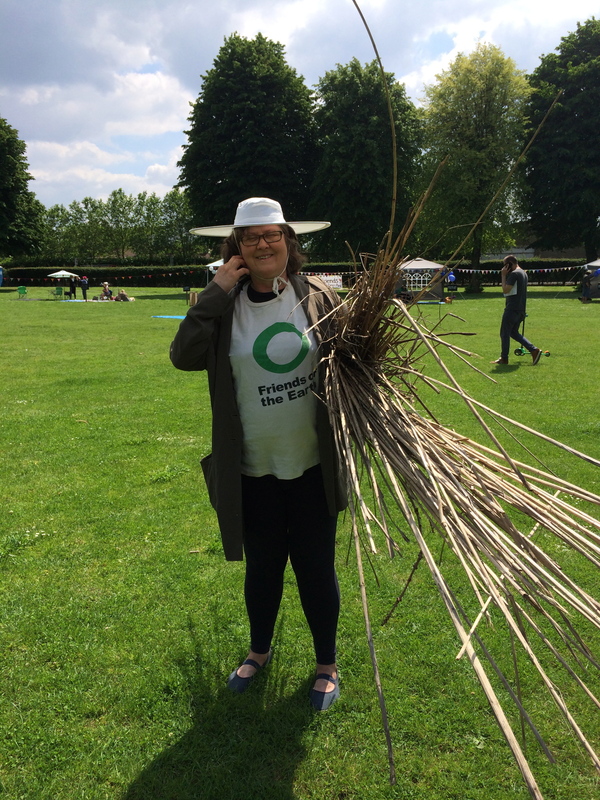 (they’d been provided by B&Q – thank you! 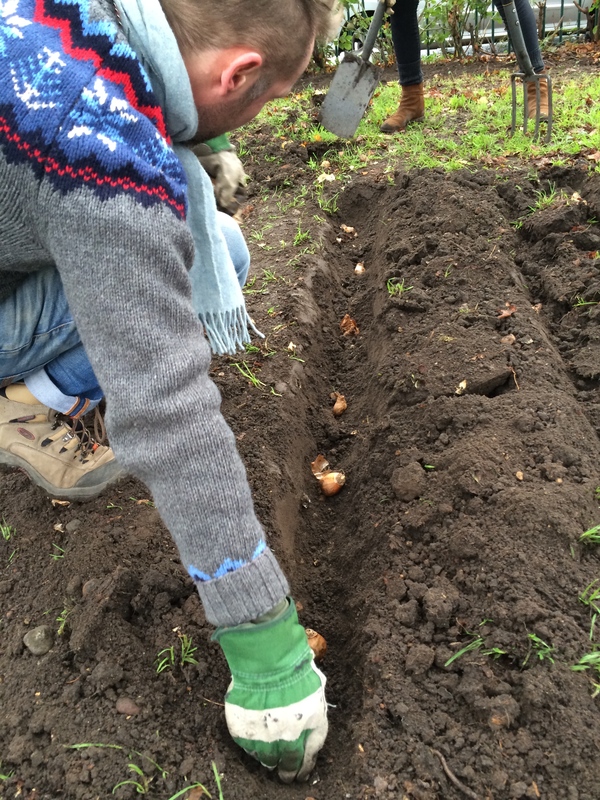 – and psst lots of their bulbs are half price right now) The weather eased too, with the worst showers happening when we were setting up, with pretty perfect conditions for the actual planting. I love our local park. It’s at the end of our road, although as it borders a cul de sac, lots of people can lay claim to that. It has a newly refurbished play area with a zipline that the entire neighbourhood seems to have tried – I am sure I’ve seen more adults than kids on it. 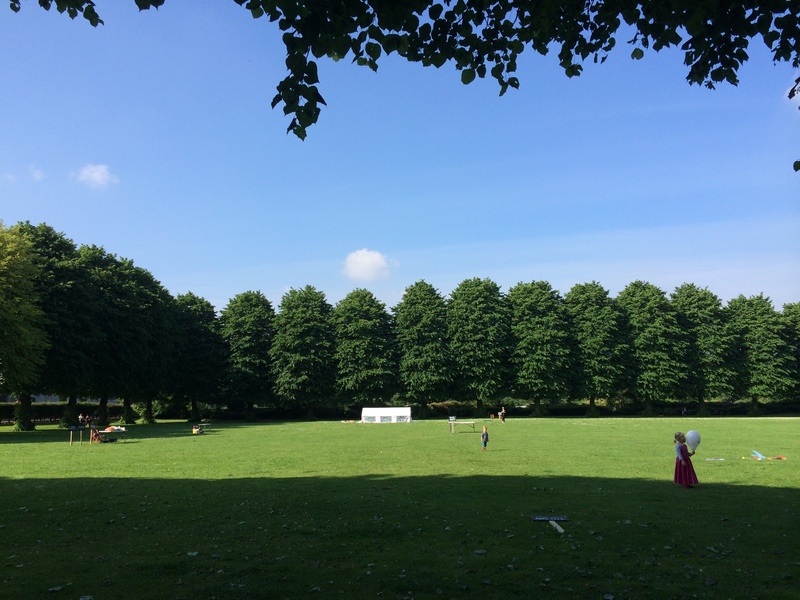 We recently set up a Friends of St James Park group, as this basically gives us a lot more credibility with the council and we can have a say in what happens in and to the park. 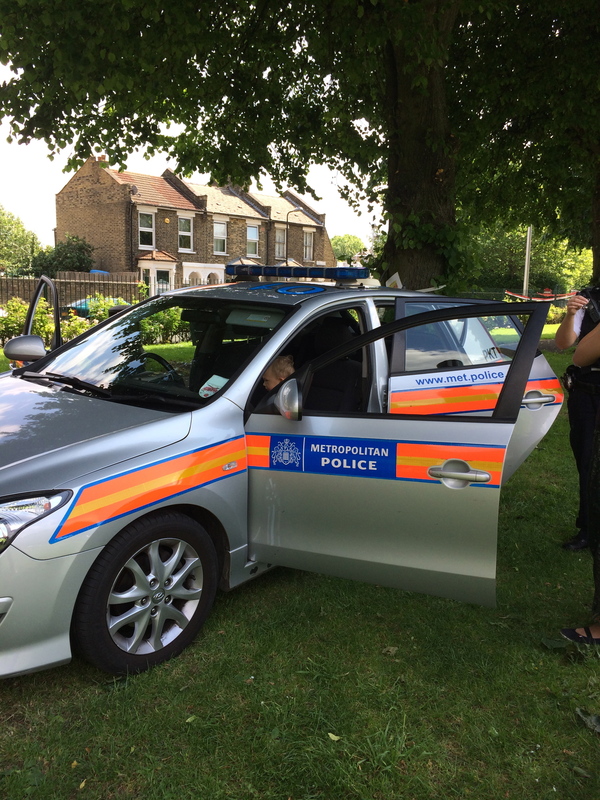 The official standing also gives us access to training in Waltham Forest to improve the group and understand how to access local services for it – it certainly all sounds promising. Some of the group were extremely hesitant to get sucked into the Facebook vortex, which is how a lot of groups seem to communicate and publicize if they haven’t gone down the route of getting their own website yet. We’ve gone with Streetclub instead – coincidentally also a B&Q thing but they don’t really get involved it it. It has the same functionality: conversations, postings, events, a diary, and the rest, but the difference is that to join your postcode should be within two miles of your chosen group’s specified location. The whole point is to keep it local. 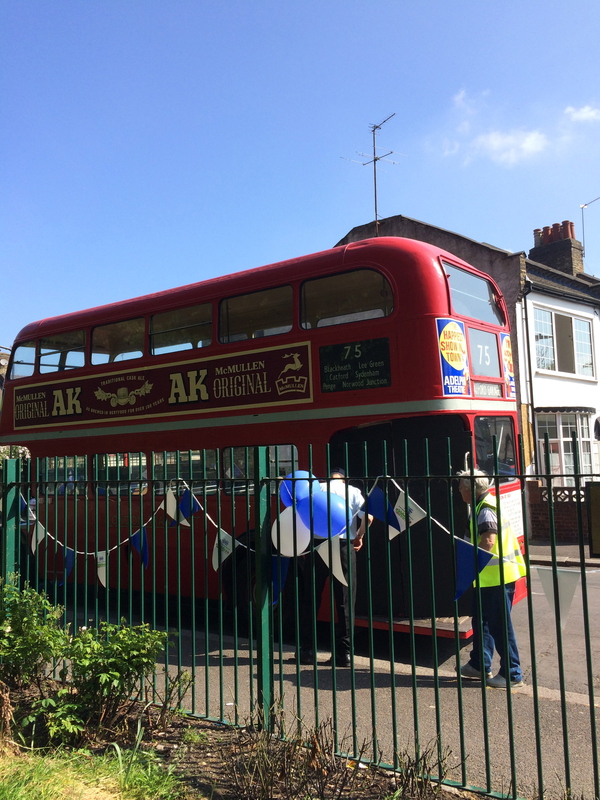 That’s why I wanted to be involved with this group really – we use the park twice a day (in better weather) and we want it to be a hub for the community, along with the lovely Pumphouse Museum. 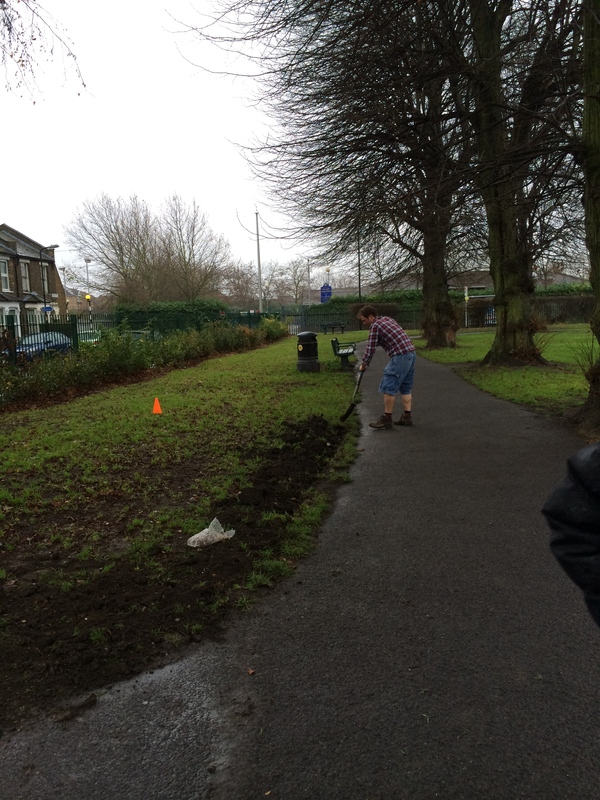 Our side of our borough is a little bit neglected and the park can be something that really unifies it. We ended up with quite a large group of people – the team you see above were on one of the four patches we planted, by the entrances and opposite the end of some of the streets which face the park so they’ll be really visible. I got talking to a lady who seemed familiar, then remembered we had chatted in the park last summer as our sons ran around us – in fact Sproggett tried to steal her [much older] son’s ball, unsuccessfully. We had a couple of teenage boys slink past, on their way out of the park, with their football boots slung around their necks. One of the planters tried to engage them in conversation. It turned out that one of them grew potatoes and beans in the back garden at home. 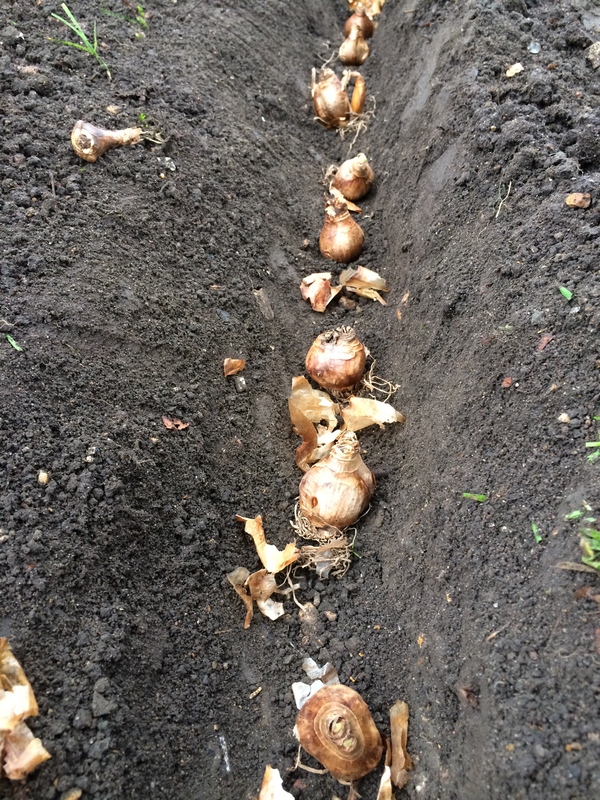 They were enticed back into the middle of the clatter, with toddlers slinging miniature trowels about, and they carefully planted a couple of bulbs each, by the notice board. “Next year I’ll be able to come back and know that that was my one,” we were told, and they were shy but proud. I can’t wait to see our handiwork in the spring.